MEAA | Do our politicians support Australian stories? 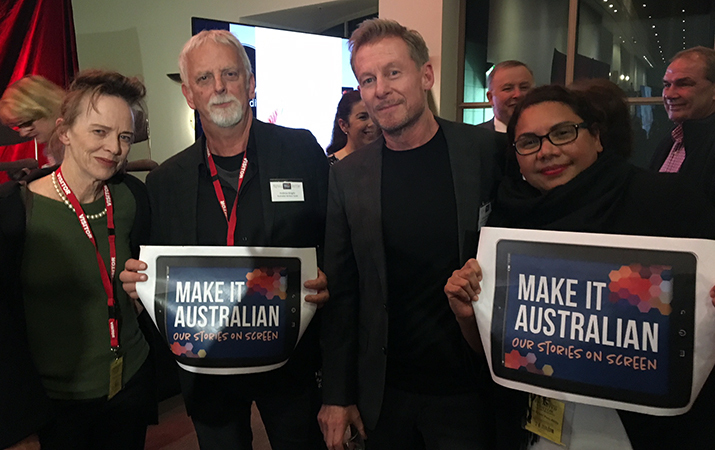 MEAA members (from left) Judy Davis, Richard Roxburgh and Deborah Mailman with screenwriter Andrew Knight during a Make It Australian lobbying visit to Canberra in 2018. With the federal election less than two months away, MEAA – along with the rest of the Make It Australian campaign – has written to the major parties seeking their support for Australian stories on screen. • adequate funding to public broadcasters and Screen Australia. The answers will be collated into a scorecard to advise members on the best way to cast a vote in the upcoming election to support our industry. The Make It Australian campaign is made up of MEAA, Screen Producers Australia, the Australian Directors’ Guild and the Australian Writers Guild. The call for support comes as alarm grows over the very low levels of Australian content on subscription/streaming video on demand (SVOD) platforms (e.g. only 1.6% on Netflix and 11.1% on Stan) as well as proposals from commercial broadcasters to drastically reduce or eliminate drama and children’s quotas. This is compounded by more than $600 million in cuts to the ABC, SBS and Screen Australia as well as screen production incentives that haven’t remained competitive with international trends.